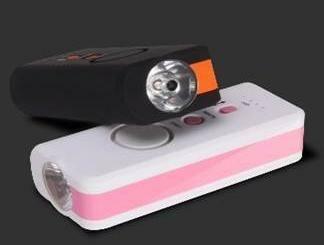 LED Incapacitator Flashlight Siren with Pepper Spray KX-200 is a small portable device that can be used at home or carried around in a purse. The device can be used as regular flashlight for directional illuminance or be used as a visual deterrent when the stun light mode is turned on. When activated, the stun light will also trigger a loud siren to alert others nearby. Pepper spray can also be deployed for close-range dual defense. Device isequipped with lithium-ion Battery for recharging with a USB or micro USB port.